Composed by Johann Sebastian Bach (1685-1750). Edited by Andreas Glockner. Arranged by Martin Focke. This edition: urtext edition. Paperback. Barenreiter Urtext. Early Version. Vocal score. BWV 244b. Baerenreiter Verlag #BA05099-90. Published by Baerenreiter Verlag (BA.BA05099-90). ISBN 9790006531738. 27 x 19 cm inches. Language: German, English. Bach's St. Matthew Passion as we know it today evidently had a long history dating back before 1727. It is unclear whether the work performed at the Thomaskirche on Good Friday 1729 was based on a still earlier version. Whatever the case, the surviving version of 1729 presents the work in a form strikingly different from its later incarnation. For example, the opening section ends with the choraleJesum lass ich nicht von mirwhich was replaced by the large-scale cantus firmus chorusO Mensch , bewein dein Sunde grossfor the 1736 performance. The well-known alto ariaAch! nun ist mein Jesus hinis still assigned to a bass in the earlier version, and the ariaKomm susses Kreuzcalls for a lute instead of the later viola da gamba . Moreover, the pieces for double chorus only require a single continuo group. Other differences can be found in the instrumental scoring and voice-leading. 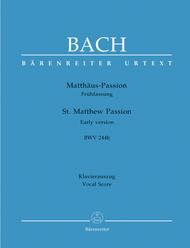 The early version of the St. Matthew Passion is thus a most interesting addition to the great concert repertoire. The corresponding volume of theNew Bach Edition(series II/volume 5b) serves as a conducting score.